Surveying has evolved throughout history from the Egyptian rope pullers at our beginning to modern 3D laser scanning using aerial drones. As our profession continues to change, the terminology of our profession is changing as well. 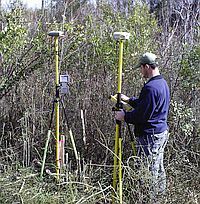 Land Surveying is commonly referred to now as "Geomatics", which is the branch of science that deals with the collection, analysis, and interpretation of data relating to the earth's surface. DMP’s Surveying Department is one of the cornerstones of our business, and one of the Triad’s largest surveying operations. Our professional surveyors are licensed in multiple states, DMP field crews are well equipped with the latest technology including global positioning receivers (GPS), robotic operating stations, and other advanced technologies. This equipment helps ensure a fast and accurate product for our customers. Our Surveying department produces a wide variety of surveys for engineering projects, private developers, contractors, NCDOT, and public utility companies. GEOMATICS ( GE•O•MAT•ICS) is the branch of science that deals with the collection, analysis, and interpretation of data relating to the earth’s surface.